Although I was truly sick of winter, we had a late snowstorm in March which was really one of the prettiest snows we’d had. 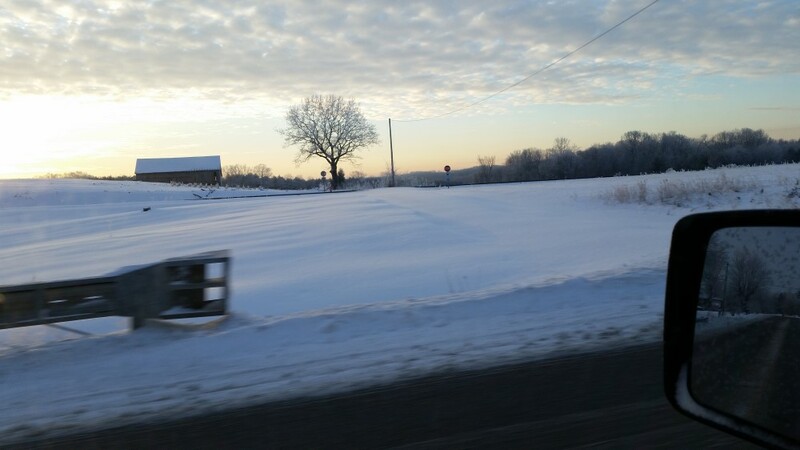 So, on my early drive to work, I took some hit and miss photos to see if I could capture the beauty. These were just random shots, not carefully aimed. I liked this one which represents the bone-chilling cold of early morning. In this case, I was trying to aim for COLD! I started on this 12 x 24 canvas with just a simple wash of blue/grey. Then added some warmer colors to capture the sunrise. Working on adding depth by deepening the darks, adding shapes, details. Final painting. I think this truly depicts the cold. Lots of cool shadows, a brush of warmer tints from the sunrise. Notice the details that I’ve actually left out, such as, the electrical wires, some additional trees, brush.